The Syosset Public Library Readers’ Services Department would like to thank the following local businesses for their generous donations to the 2017 Adult Summer Reading Club! Max & Gino’s All American Clothing Co.
Pictured above Readers’ Services librarians with author Camille Perri (from left to right) Stacey Levine, Evelyn Hershkowitz, Camille Perri, Lisa Jones, Jean Simpson and Head of Readers services, Jackie Ranaldo. Adult Summer Reading 2016: THANKS! The Syosset Public Library Readers’ Services Department would like to thank the following local businesses for their generous donations to the 2016 Adult Summer Reading Program. We truly appreciate your continued support! The Syosset Public Library Readers’ Services Department would like to thank the following local businesses for their generous donations to the 2015 Adult Summer Reading Club! Pictured above: Readers’s Services Librarians with guest author: (left to right) Evelyn Hershkowitz, Stacey Levine, author Rosanna Chiofalo, Jackie Ranaldo and Jean Simpson. The Balloons at the August 12 Wrap-Up party were generously donated by Party City (Woodbury). for their generous book donations used for our weekly raffle prizes and genre book sets! in politics, music and art. Lollipop Farm Train Back on Track! The newly restored Lollipop Farm Train will make its debut this weekend at the Greenlawn Pickle Festival. On Saturday, September 21, the Greenlawn-Centerport Historical Association will host the 34th annual Pickle Festival at the John Gardiner Farm, located at 900 Park Avenue, Huntington. Among the many events and activities, the highlight will be the opening of the original Lollipop Farm Train, which has recently been restored by members of the Historical Association. The train will be open for children to enjoy a ride and experience a piece of Syosset history. The train was a prime attraction at the Lollipop Farm petting zoo, located at Jericho Turnpike and Jackson Avenue. The original train locomotive has been fitted with a new engine, and the train has been repainted to its original yellow and red color scheme. In addition to the train, the Pickle Festival will feature hay rides, a corn maze, potato digging demonstrations, antique cars and trucks, home-baked goods and local farm produce. For more information about the Pickle Festival call 631-754-1180. The John Gardiner Farm is located at 900 Park Avenue, Huntington, NY. Did you miss the Lollipop Farm Train? Watch the Slide Show. If you missed our recent program about the Lollipop Farm Train restoration, you can learn about this outstanding project by visiting the Local History page of the Library Website. Follow the link for Lollipop Farm Train and see for yourself how the Greenlawn-Centerport Historical Association is bringing the train back to life. Lollipop Farm Train to Roll Again! Many Syosset residents can recall the great fun they had as children riding the Lollipop Farm train. Soon we will be able to share those memories with our own children and grandchildren. The Greenlawn-Centerport Historical Association has acquired the original Lollipop Farm train and is currently restoring it and readying it for installation at the John Gardiner Farm in Huntington. Lollipop Farm was a petting zoo located at Jericho Turnpike and Jackson Avenue. The farm was owned and operated by Harry Sweeney from the early 1950s until it closed in 1967. One of the great attractions of Lollipop Farm was the Train which carried children through the zoo. After the Farm closed, the train passed through several owners until it ended up in the storage barn of the Society for the Preservation of Long Island Antiquities, where it remained until the current restoration project. The original train locomotive has been fitted with a new engine, and the train has been repainted to its original yellow and red color scheme. Restoration of the Lollipop Farm train. The Greenlawn-Centerport Historical Association anticipates that the train will be up and running later this summer. 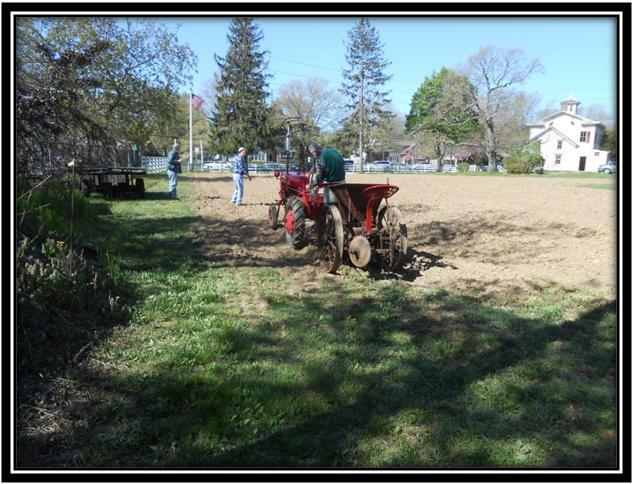 The John Gardiner Farm is located at 900 Park Avenue, Huntington, NY.